Caterpillars? Yummy, just what every good diet needs. Or not: I now feel a little scared to eat my broccoli without completely mushing it up to make sure it really is just broccoli. But, that said, caterpillars are the only downside I’ve come across with ordering a weekly veg box. Riverford Farm is my new big thing. Bron and I have been ordering fruit and vegetables from them since the start of summer, and they are amazing. Each week a beautiful cardboard box almost miraculously appears in my shed, full of organic vegetables that are so fresh they still have the earth on them. Oh, and the occasional caterpillar. 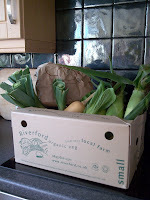 Even better than the vegetables (and eggs, and bread, and wine) is Riverford’s packaging policy. Send the veg box back each week and it gets re-used. Tomatoes and mushrooms arrive in lovely little cardboard punnets that can go in your recycling, or can be re-used as seed trays, for storage, or for your child to make that robot they’ve been going on about for the last three days. Bananas, apples, courgettes, and that caterpillary broccoli all come in paper bags. I’ve never received that bane of vegetable packaging, the plastic punnet, but I should probably confess that they do, on occasion, use plastic bags. But it's not an absolute disaster because Riverford recycles them. Therefore, I don’t count them as plastic entering my home because I know it’s only on a temporary basis. They never go anywhere near my bin: I simply send them back with the empty box. I’m always wondering how much of the plastic that goes out with my recycling actually gets recycled, but by sending these bags back to their source, I feel confident that they really are.